Need a reliable door and gate service provider for your business in Houston? Well, your search ends here! Sentry Garage Door & Gates is a leading door and gate company that has been serving commercial and industrial clients in and around Houston. We are trusted for over a decade for specializing in commercial gate installation, repair and maintenance services. Sentry commercial gates repairs all openers. Same day service! Sentry designs, builds, & repairs commercial gates. Same day service! Commercial security gate opener repair, & service. Best quality design & install. Having problem with your commercial gate? We understand that commercial gates should always be functional to ensure safety and security of the premises. This is the reason why we offer emergency commercial gate repair services. No matter how big or small the problem with your commercial gate is, we will do our very best to resolve the problem at the earliest. We can guarantee the quality of our work since we employ highly skilled technicians who undergo elaborate training and have passed all the rigorous background checks that we perform for your peace of mind. Our technicians are well equipped and have all the hardware and spare parts loaded in the vans to accomplish the repair works in the shortest possible time. 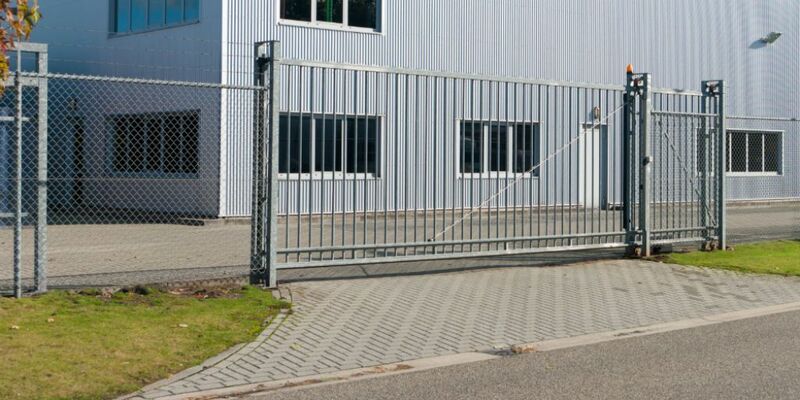 Installing a commercial gate is of no use without the right gate operator or access control system. At Sentry Garage Door & Gates, we offer the largest range of commercial gate openers for all kinds of commercial gates. With quality products from the leading manufactures and professional installation, you can totally rely on our service. Our team of technicians will help you choose the right gate opener and get it installed in the most hassle-free manner. Our commercial gate openers are the perfect choice when it comes to easier and faster access to your office, warehouse, or garage. Protect the premises along with increasing the efficiency of your business with high quality commercial gate openers from Sentry Garage Door & Gates. Whether you need a new gate opener to be installed or replace a malfunctioning gate opener, we can help you with everything. Just give us a call and let us know your requirements. Need to install pipe gates to secure the animals in your farmhouse or commercial premises? Sentry Garage Door & Gates offers strong, durable and versatile pipe gates of all sizes to help you keep your livestock safe and secured. Pipe gates designed and manufactured by our team are strong enough to contain livestock or animals of any kind. We offer custom-made pipe gates, so that they can be made to fit your specific requirements. Our team will perform a commercial gates Houston inspection of the property where the pipe gate needs to be installed and offer a free estimate. Upon agreement, our team will reach fully equipped and get the gate installed quickly and efficiently. For anything related to commercial gates, we have a solution for you. You can reach us on 281-520-3984 at any time of the day (even at the middle of the night) and we’re there to help you!